Intel just started shipping their i3 7th Gen (Kaby Lake) Intel NUCs and no surprise, Florian of virten.net has already gotten his hands on a unit for testing. The Intel NUCs is a very popular platform for running vSphere/vSAN-based home labs, especially for their price point and footprint. Last week, Florian discovered from his testing that the built-in network adapter on the 7th Gen NUC was not being detected by any of the ESXi installers and had published his findings here. Since the Intel NUC is not an officially supported platform for ESXi, it does not surprise me that these sort of things happen, even if the NUC had a pretty good track record going back to the 5th Gen releases. Nonetheless, I reached out to Florian to see if he can provide me with a vm-support bundle and see if there was anything I could do to help. A couple of Engineers took a look and quickly identified the issue with the Kabylake NIC (8086:15d8) but before getting to the solution, I did want to clarify something. The Kabylake NIC is actually NOT an officially supported NIC for ESXi and although it currently shows up in the VMware HCL, it is a mistake. I have been told the VMware HCL will be updated shortly to reflect this, apologies for any confusion that this may have caused. Ok, so the great news is that we do have a solution for getting ESXi to recognize the built-in NIC on the 7th Gen Intel NUCs. The semi-bad news is that we currently do not have a solution in the short term for any released version of ESXi, as the fix will require an updated version of the e1000e Native Driver which will only be available in a future update of ESXi. I can not provide any timelines, but keep an eye on this blog and I will publish more details once they are available. In the meantime, if you already own a 7th Gen NUC, there is a workaround which Florian has already blogged about here which uses the USB Ethernet Adapter VIB for the initial ESXi installation. If you are planning to purchase the 7th Gen NUC and would like to wait for folks to confirm the fix, then I would recommend holding off or potentially looking at the 6th Gen if you can not wait. Thanks to Florian and others who shared their experiences with the 7th Gen NUC and also to the VMware Engineers who found a quick resolution to the problem. UPDATE (07/27/17) - The updated e1000e Native Driver that was included in ESXi 6.0 Update 3 is now included in ESXi 6.5 Update 1 which just GA'ed. You should be able to install ESXi without require any additional modifications to the latest Intel NUCs. UPDATE (02/24/17) - An updated e1000e driver which contains a fix for 7th Gen NUC is now available as part of ESXi 6.0 Update 3, below are several options in how you can consume the driver. UPDATE (05/26/16) - With some further investigation from folks like Erik and Florian, it turns out the *only* device that needs to be disabled for ESXi to successfully boot and install is the Thunderbolt Controller. Once ESXi has been installed, you can re-enable the Thunderbolt Controller and Florian has also written a nice blog post here which has instructions as well as screenshots for those not familiar with the Intel NUC BIOs. Over the weekend, I had received several emails from folks including Olli from the nucblog.net (highly recommend a follow if you do not), Florian from virten.net (another awesome blog which I follow & recommend) and few others who have gotten their hands on the "Skull Canyon" system. They had all tried to install the latest release of ESXi 6.0 Update 2 including earlier versions but all ran into a problem while booting up the ESXi installer. 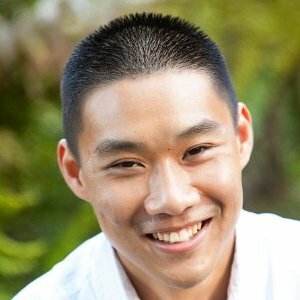 Raymond Huh was the first individual who had reach out to me regarding this issue and then shortly after, I started to get the same confirmations from others as well. Raymond's suspicion was that this was related to the amount of Memory-Mapped I/O resources being consumed by the Intel Iris Pro GPU and does not leave enough resources for the ESXi installer to boot up. Even a quick Google search on this particular error message leads to several solutions here and here where the recommendation was to either disable or reduce the amount of memory for MMIO within the system BIOS. Unfortunately, it does not look like the Intel NUC BIOS provides any options of disabling or modifying the MMIO settings after Raymond had looked which including tweaking some of the video settings. He currently has a support case filed with Intel to see if there is another option. In the mean time, I had also reached out to some folks internally to see if they had any thoughts and they too came to the same conclusion that without being able to modify or disable MMIO, there is not much more that can be done. There may be a chance that I might be able to get access to a unit from another VMware employee and perhaps we can see if there is any workaround from our side, but there are no guarantees, especially as this is not an officially supported platform for ESXi. I want to thank Raymond, Olli & Florian for going through the early testing and sharing their findings thus far. I know many folks are anxiously waiting and I know they really appreciate it! 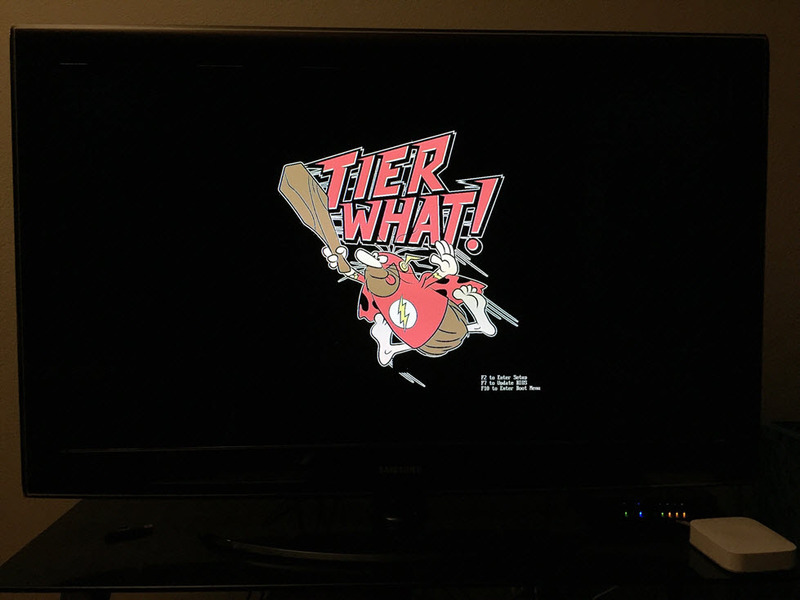 One of the last things I wanted to look into after setting up my new VSAN 6.2 home lab on the new 6th Gen Intel NUC was to add a custom BIOS splash screen giving my system a personal touch. Updating the BIOS splash screen would require flashing the BIOS itself which gave me some concerns after hearing about the BIOS v33 issue in which the M.2 slot would no longer be detected after the update. Although there was a simple workaround after the update, I still wanted to be cautious. Over the weekend I had noticed that Intel had released BIOS v36 for the Intel NUC which resolved the M.2 issue among a few others. I decided to give it a shot and hope that I that I do not brick my NUC. The process for building and customizing your Intel NUC BIOS is relatively straight forward but because I waited until after I had everything installed, it ended up being a bit more work than I had hoped. 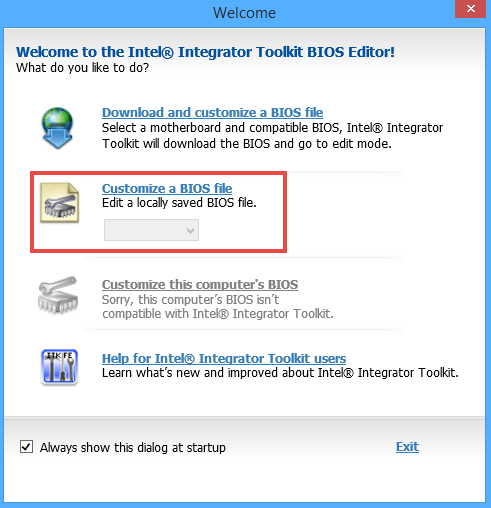 To customize your BIOS, Intel provides a Microsoft Windows only utility called Intel Integrator Toolkit. The easiest way to build and update your BIOS is to initially start off by installing Microsoft Windows on the Intel NUC itself which then allows you to easily flash the BIOS using the executable that is generated from the toolkit. Since I had already consumed both of my SSDs for VMware VSAN and Microsoft Windows does not allow you to install its OS directly onto a USB device, I had to use this method here to install a bootable version of Microsoft Windows onto the USB device since I did not want to blow away my VSAN setup. OK, so now onto the cool stuff. Below are the instructions on how to build and customize your BIOS for the Intel NUC. If you would like to use the exact same BIOS splash screen as well as update to the latest BIOS v36 and do not want to go through the hassle, I have made my custom VSAN BIOS image available here. You just need to download the executable and run it on the Intel NUC itself which must be running Microsoft Windows (I used 8.1) and then follow the screens on flashing your BIOS. 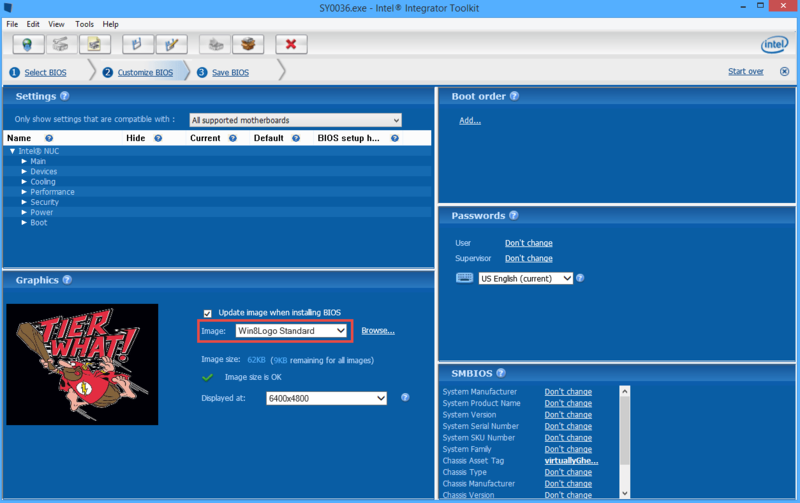 Step 3 - Select the "Customize a BIOS file" option and load either the custom VSAN BIOS image which I have made available here OR load the NUC BIOS v36 file you had downloaded earlier. Step 4 - In the lower left hand corner, browse for the graphic image that you wish to use for your BIOS splash screen (images with black background works the best). For those interested, you can find the Captain VSAN image that I had used here. The tool actually supports several image formats in addition to the default BMP such as JPEG and PNG, you just need to change the extension type. There is a size limitation, but the nice thing about the tool is that there is an option to compress the image when it detects it is too large. Make sure to change the image for the four different options by clicking on the drop down wizard. I thought I only had to replace the first image but it looks like other versions of the splash screen is also used and it is best to just replace them all. You also have the option of changing other default settings in the BIOS, feel free to click on the tooltip for details on each of the options. Step 5 - Once you are done customizing your BIOS, you will then save your changes and the tool will produce a single Windows executable (SY0036.exe) which you will run on the NUC itself to flash the BIOS. You will be prompted with a couple of questions and once the process begins, it will restart and you will need to confirm one more time before the imaging process starts. If everything was successful, you should now see a new BIOS splash screen replacing the default Intel image. There is a good chance you may go through this process a few times depending if you are happy with the splash screen display. I think it took me about three tries. Hope this helps anyone looking to add that personal touch to their home lab!